Microprocessor based Tablet Disintegration Machine is used for testing the disintegration time for tablets, capsules, and other solid dosage forms. Tablet Disintegration Machine is designed to meet the specifications of USP/IP/BP pharmacopoeia. Acrylic Tank is placed on the platform. A square shaped immersion Heater is also fitted to this acrylic water bath. Two 1000 cc capacity beakers supplied with the equipment are filled with water and placed on the stand in the water tank. 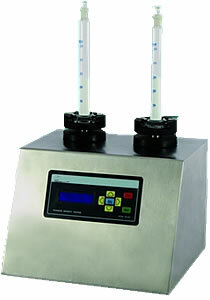 The water in the waterbath is maintained at 37° C with an accuracy ± 0.3° C. Temperature setting is not required. The built-in RTD sensor maintains the bath temperature. Temperature and time indicators have both combined in one display unit thereby providing accurate digital indication of both parameters. 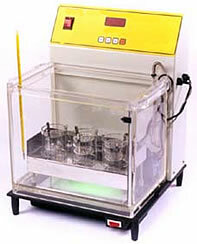 The equipment can carry out two disintegration test of tablets simultaneously. It works on 230 volts single phase A.C. 50 Hz. Power : 230 V 50 Hz. x 27cm H fitted with immersion heater of 500W. The water bath tank is fixed on a mild steel plate, size 33 cm L x 36 cm W x 0.5 cm thickness. Front panel incorporates main switch, temperature/Timer display. Imported water circulation pump is provided to keep the temperature of the water bath uniform. Green light illumination in acrylic bath for better viewing of Disintegration. A 500 W water heater running on all the four side of the waterbath is fixed at the bottom of the waterbath. Temperature and time indications have both combined in one display unit thereby providing accurate digital indications of both the parameters. The indicator shows temperature and time alternatively every 5 seconds. The temperature sensing is done by PT-100 probe. 3 Nos. transparent sleeves of Glass (Height 60cm) with an internal diameter of 52cm and wall thickness of about 3.5mm is fitted with stainless steel metal discs each of which contains 39 holes of 4mm each in diameter being distributed as per the specifications given by USP Std. The discs are separated by distance of about 30cm. The metal device is attached to the outer sleeves by means of three equally spaced hooks. The equipment is suitable for 230 V AC 50 Hz and supplied with 2mt connecting cable. Easy to operate all the functions. Two Cylinders holder having easy mechanism to insert and take out. Simultaneous tapping and rotating assures an evenly packed surface. Calculation of test results will be displayed directly on the instrument panel by feeding the correct data. The Powder Density Apparatus is specially designed to study the packing down of powder beds of different pharmaceuticals and chemicals powders, flakes, pellets, granules and other bulk substances. Powder Density is an essential test required in the process of tablet manufacturing, Capsule filling and cosmetic manufacturing. 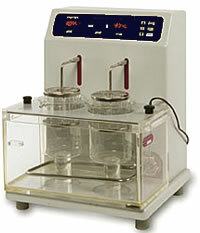 The Powder density apparatus is equipped with Microcomputer Based 'LCD Display' System. The "SWITCHES" are provided on the front panel of the apparatus for setting total number of strokes to the glass cylinders. Each stroke of the cylinder is displayed on the "LCD Display' window on the panel. The Up and down movement of the cylinders stop automatically at the Pre-set number. The advantage of Micro-Computer based LCD Display over the Old type model with the mechanical Timer is that "Digital Display" of total strokes gives accurate and exact number of Strokes given to the cylinders. The switches can be set to any required strokes start right from minimum 1Stroke to 9999 strokes maximum. Weight: Net Wt 15 Kgs. In the new and sophisticated model, Calculator is not required for test results. The results will be displayed directly on the instrument panel by feeding the correct data. Apparatus is suitable for working on 230 Volts, Single Phase A.C. 50Hz. Supplied with a pair of 50 ml glass cylinders and connecting cable.